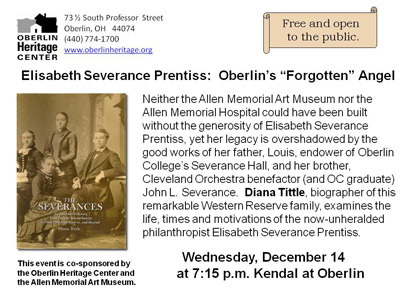 December 14 (Wednesday at 7:15 p.m.) Elisabeth Severance Prentiss: Oberlin's "Forgotten" Angel. Neither the Allen Memorial Art Museum nor the Allen Memorial Hospital could have been built had it not been for the generosity of Elisabeth Severance Prentiss, but, even in Oberlin, her legacy has been overshadowed by the good works of her father, Louis, endower of Oberlin College's Severance Hall, and her brother, Cleveland Orchestra benefactor (and Oberlin College graduate) John L. Severance. The Severances' longstanding involvement with and allegiance to this community will be traced by journalist Diana Tittle, author of a 2010 biography of this remarkable Western Reserve family, in an illustrated lecture examining the life, times and motivations of the now-unheralded philanthropist Elisabeth Severance Prentiss. The program is co-sponsored by the Heritage Center and the Allen Memorial Art Museum. Location: Heiser Auditorium, Kendal at Oberlin. Free and open to the public.